A cruise to the eastern Caribbean Sea is one of the most popular itineraries for cruise lovers. It's no wonder. These ports of call offer everything cruise vacationers are looking for—great beaches, sparkling blue waters, fascinating geological and historical sites, amazing marine and island wildlife, outdoor water and island activities, great ocean views, and excellent shopping opportunities. Some of the cruise centers are specially constructed by the cruise companies and others are part of the regular port's domain. Amber Cove, on the north coast of the Dominican Republic, is one of the eastern Caribbean's newer ports of call. Carnival Corporation opened the cruise center in 2015 and Amber Cove quickly became popular with cruisers arriving on Carnival, Holland America, Princess, Costa, and P&O ships. Those who love fun in the sun will especially appreciate Amber Cove. Although a purpose-built cruise center and not an island city or town, Carnival has added many activities and features that travelers will love like beaches, swimming pools, cabanas, zip-lining, a dolphin center, retail shops, and places to eat and drink. You can get in touch with the local culture by signing up for an experience at the Fathom Impact Center or rent a car and explore the area a little bit. The nearby town of Puerto Plata offers a taste of local culture and history. 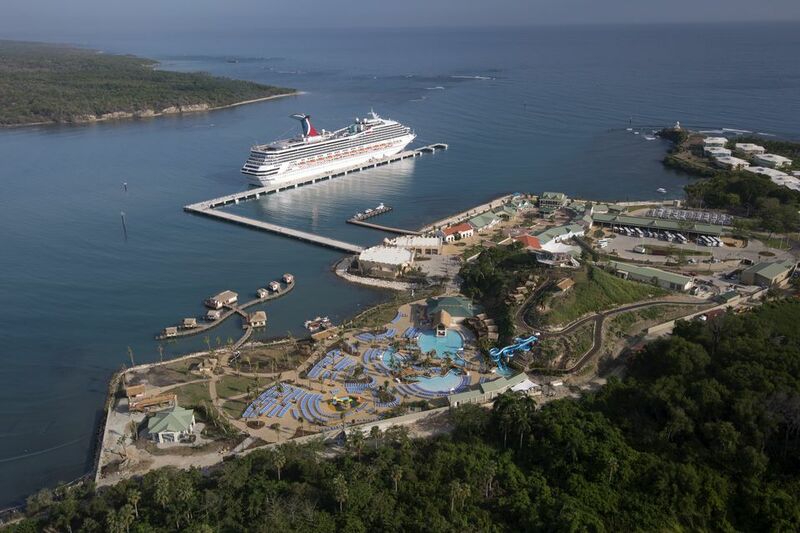 Carnival Corporation has Amber Cove on the north shore of the Dominican Republic, and Royal Caribbean has Labadee on the north shore of Haiti. This private beach resort offers lots of fun on the beach and in the pools, along with water sports like kayaking, parasailing, and snorkeling. The cruise line also offers shore excursions outside the resort for those who want to see more of the Haitian countryside. The Bahamas are in the Atlantic Ocean, not the Caribbean, but for many, Nassau is the first cruise port ever visited. And, the town is often included on eastern Caribbean cruises. Most people seem to equate Nassau with the Bahamas, although the country has many inhabited islands, including Freeport and several that are used by cruise lines as "private" islands. Nassau is the capital of the Bahamas and is located on New Providence Island. The island is mostly flat, with beautiful beaches and sparkling blue water. A dozen cruise ships can simultaneously dock in Nassau, so the town is very busy with travelers. The port is right next to the downtown area, and shoppers will find plenty of places to spend their time and money. Nassau has several interesting historic sites, so a walking tour is recommended for those who enjoy a guided tour. Many cruise visitors visit nearby Paradise Island, home of the famous Atlantis resort complex. Others play golf, go snorkeling, or just find a picturesque beach. St. Maarten is the Dutch side of an eastern Caribbean island with two distinct cultures, Dutch and French. The two countries on the island even have different spellings, with the French half spelled St. Martin. Most large cruise ships dock at Philipsburg, the capital of St. Maarten, while smaller ships anchor at Marigot, the French capital. Although St. Maarten/St. Martin is small, it takes a couple of hours to ride between the two cities. Philipsburg and Marigot both have good shopping, and the beaches on the island are lovely. The most well-known beach is at Baie Orientale (Orient Beach) on the French side. Although it's most famous for being "clothing optional," the beach is gorgeous and has some good cafes and bars. The island has several other spectacular beaches, but only those on the French side of St. Martin are clothing optional. The island has several other activities other than shopping or sitting on the beach. Snorkeling is good at some of the beaches or while on a catamaran shore excursion. An island tour of St. Maarten/St. Martin is also fun since the French and Dutch sides are so different. St. Thomas is the cruise lines' most popular port in the Caribbean, with ships visiting almost every day. Ships dock at either Havensight or Crown Bay. These two ports are on opposite sides of Charlotte Amalie, the capital of St. Thomas. The Charlotte Amalie harbor on St. Thomas is in a beautiful setting, and the town certainly has enough stores to tempt every traveler. Since it's in the USA, the shopping, currency, and language are all familiar to Americans. Many cruise visitors take one of the many open-air taxi tours of the island or choose to visit nearby St. John, most of which is a national park with gorgeous beaches and good snorkeling. St. Thomas has many offshore excursion options for such activities as sailing or snorkeling. The area has clear water and many old shipwrecks, which make diving a good choice, too. Other popular St. Thomas excursions include golf, rides on an Atlantis submarine under the ocean, or a seaplane or helicopter ride over the ocean. Those who spend most of their day shopping at Havensight Mall might want to take the nearby cable car to the top of Paradise Point for a great view of St. Thomas. Like St. Thomas, Puerto Rico is part of the USA, and the capital, San Juan, is a very popular port of call. Ships dock near the old town, and it's fun to explore this historic city. If you haven't been to San Juan before, spending the day in the old part of the city and visiting the two major fortresses is a good introduction to the history and vibe of the city. If you want to venture out to see more of the island, hiking in the El Yunque National Forest is interesting and a way to get some exercise. If your ship is overnighting in San Juan, you might want to take a kayaking tour of the bio-luminescent bay near Fajardo. Paddling at night through a mangrove forest to a quiet bay filled with glowing micro-organisms is certainly memorable! Note: As with any island hit by major storms, it is important to check on the status of attractions before planning to include them in your visit. Not many large cruise ships visit Virgin Gorda, but this interesting island is one of the British Virgin Islands and is popular with small ships and for day trippers from Tortola or St. Thomas. Virgin Gorda has several nice beaches but is most famous for its area of giant boulders called The Baths. You can learn a bit about the eclectic history of the area by visiting the Spanish ruins at Little Fort National Park just south of the yacht harbor or have a look at the Cornish Copper Mines on the island’s southwestern tip. Although several of the islands in the eastern Caribbean are famous for their towns and good shopping, Dominica will appeal to anyone who loves the outdoors and nature. In fact, it's often called the "Nature Island." Dominica is perfect for hiking, river rafting, snorkeling, and a wide range of outdoor pursuits. One fun snorkeling excursion on Dominica is south of the capital Rousseau at Soufriere. This area has geothermal vents under the water whose gasses make the area all "bubbly" and like snorkeling in a glass of champagne. Barbados is in the southeast Caribbean and is usually included on either longer cruises or on those embarking from San Juan. Barbados has a British heritage, and the island has the Caribbean on its calm western coast and the rougher Atlantic Ocean on its eastern coast. Barbados has a good variety of things to do. It has good beaches, fascinating caves, rum and cigar factories, and some historic sugar plantations like the Sunbury Plantation.